Click Here for official study details on ClinicalTrials.gov. 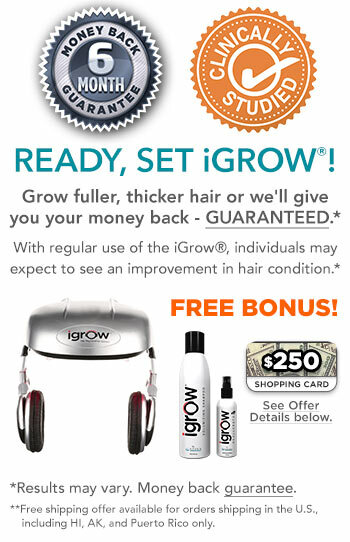 The iGrow Hair Growth System has been verified by thorough research, and Apira Science has conducted separate clinical studies for both men and women. Please see below for Published Abstracts. The Growth of Human Scalp Hair in Females Using Visible Red Light Laser and LED Sources. Lanzafame RJ, Blanche RR, Chiacchierini RP, Kazmirek ER, Sklar JA. Background and Objectives: Low Level Light therapy (LLLT) has been demonstrated to promote hair growth in males. A double-blind randomized controlled trial was undertaken to define the safety and physiologic effects of LLLT on females with androgenic alopecia. Forty Seven women between the ages of 18—60 with Fitzpatrick Skin Types I—IV and Ludwig— Savin Baldness Scale I-2—II-2 baldness patterns. were recruited. A transition zone scalp site was selected; hairs were trimmed to 3 mm height; the area was tattooed and photographed. The active group received a “TOPHAT655” (iGrow unit) unit containing 21, 5 mW lasers (655 +/- 5 nm), and 30 LEDS (655 +/- 20 nm), in a bicycle-helmet like apparatus. The placebo group unit appeared identical, containing incandescent red lights. Patients treated at home every other day ✕ 16 weeks (60 treatments, 67.3 J/cm(2) irradiance/ 25 minute treatment), with follow up and photography at 16 weeks. A masked 2.85 cm(2) photographic area was evaluated by another blinded investigator. The primary endpoint was the percent increase in hair counts from baseline. Forty-two patients completed the study (24 active, 18 sham). No adverse events or side effects were reported. Baseline hair counts were 228.2_133.4 (N.18) in the sham and 209.6_118.5 (N.24) in the active group (P.0.642). Post Treatment hair counts were 252.1_143.3 (N.18) in the sham group and 309.9_166.6 (N.24) in the active group (P.0.235). The change in hair counts over baseline was 23.9_30.1 (N.18) in the sham group and 100.3_53.4 (N.24) in the active group (P<0.0001). The percent hair increase over the duration of the study was 11.05_48.30 (N.18) for the sham group and 48.07_17.61 (N.24) for the active group (P<0.001). This demonstrates a 37% increase in hair growth. LLLT of the scalp at 655nm significantly improved hair counts in women with androgenetic alopecia at a rate similar to that observed in males using the same parameters. Lasers Surgery and Medicine 2014 Apr; 46(4):373. Background and Objectives: Low level laser therapy (LLLT) has been used to promote hair growth. A double-blind randomized controlled trial was undertaken to define the safety and physiologic effects of LLLT on males with androgenic alopecia. Methods Forty-four males (18-48 yo, Fitzpatrick I-IV, Hamilton-Norwood IIa-V) were recruited. A transition zone scalp site was selected; hairs were trimmed to 3 mm height; the area was tattooed and photographed. The active group received a “TOPHAT655” unit containing 21, 5 mW lasers (655 +/- 5 nm), and 30 LEDS (655 +/- 20 nm), in a bicycle-helmet like apparatus. The placebo group unit appeared identical, containing incandescent red lights. Patients treated at home every other day × 16 weeks (60 treatments, 67.3 J/cm(2) irradiance/25 minute treatment), with follow up and photography at 16 weeks. A masked 2.85 cm(2) photographic area was evaluated by another blinded investigator. The primary endpoint was the percent increase in hair counts from baseline. Forty-one patients completed the study (22 active, 19 placebo). No adverse events or side effects were reported. Baseline hair counts were 162.7 +/- 95.9 (N = 22) in placebo and 142.0 +/- 73.0 (N = 22) and active groups respectively (P = 0.426). Post Treatment hair counts were 162.4 ± 62.5 (N = 19) and 228.7 +/- 102.8 (N = 22), respectively (P = 0.0161). A 39% percent hair increase was demonstrated (28.4 +/- 46.2 placebo, N = 19; 67.2 +/- 33.4, active, N = 22) (P = 0.001) Deleting one placebo group subject with a very high baseline count and a very large decrease, resulted in baseline hair counts of 151.1 +/- 81.0 (N = 21) and 142.0 +/- 73.0 (N = 22), respectively (P = 0.680). Post treatment hair counts were 158.2 +/- 61.5 (N = 18) and 228.7 +/- 102.8 (N = 22) (P = 0.011), resulting in a 35% percent increase in hair growth (32.3 +/- 44.2, placebo, N = 18; 67.2 +/- 33.4, active, N = 22) (P = 0.003). LLLT of the scalp at 655 nm significantly improved hair counts in males with androgenetic alopecia. LIMITED TIME RISK FREE OFFER! CLICK HERE TO ORDER YOUR IGROW® TODAY!